Thank YOU! to everyone who made the Community Band Festival of the Midlands successful. June 30, 2018 was a hot, humid day with the threat of storms in the late afternoon to early evening. Every group performed wonderfully to small, but appreciative audiences. A summer storm was coming in rapidly from the West when the Nebraska Wind Symphony took the stage as the final band of the day. 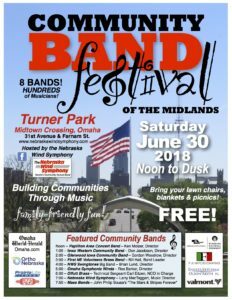 NWS Director, Larry MacTaggart, quickly made the decision to move on to our grand finale, mass band selection, “The Stars and Stripes Forever”. After a rousing rendition, everyone quickly cleared the stage and began stowing equipment. Nearly everything managed to make it to the vehicles before a nice, strong rain began. It dampened the area, but not the excitement and spirit of the band festival. See the Printed Program and read more about the festival below. The Nebraska Wind Symphony firmly believes that music helps build strong communities. For over 40 years this has driven what we do as an organization. 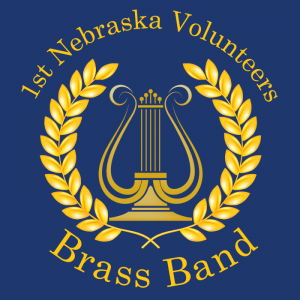 The Nebraska Wind Symphony is proud to present the first ever Community Band Festival of the Midlands. 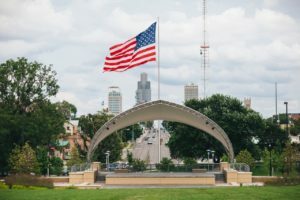 Beginning at noon with a kickoff ceremony, eight wind and percussion ensembles from across eastern Nebraska and western Iowa will perform, one after another, in a traditional music-in-the-park setting. 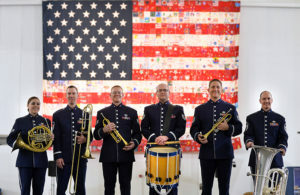 We estimate a rotating audience of over 1,000 throughout the afternoon to our grand finale of a mass band performance of John Philip Sousa’s classic, The Stars and Stripes Forever! A huge THANK YOU! to these businesses and individuals for their financial support of this event. Engles, Ketcham, Olson & Keith P.C. Join us in support of this first ever Community Band Festival of the Midlands. Your donation to help fund this event is greatly appreciated.